In order that tools always arrive on time at the machine, the Tubingen TDM System GmbH has developed the "TDM Machine Tool Manager". As a result, machine downtimes due to missing tools are reduced to a minimum. The TDM Machine Tool Manager makes it possible to schedule tools simply and transparently as soon as a new requirement is assigned to a machine. With the TDM Machine Tool Manager, new production jobs and machine-tool loading are seamlessly coordinated. 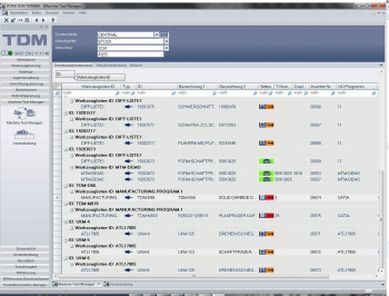 As soon as the list of tools required is generated from the NC program, the TDM software compares the tools currently present at the machine, determines the additional net requirements and automatically creates a picking list. The items required are booked out of the tool crib or shuttle tool cabinet and moved to the assembly shop. The tool assemblies required are then taken for presetting. In order that tooling data does not have to be entered manually on the presetting unit, TDM provides proven interfaces to the most popular presetting units (DMG, Kelch, Zoller and Speroni, amongst others). The tool assemblies are on the machine at the same time as the NC program. "The TDM Machine Tool Manager provides production staff with an easy-to-handle, clear solution for loading their machines with tools in accordance with their requirements," explains Christian Kubel, Head of Sales Services at TDM Systems in Tubingen. At the same time, auxiliary tools and other types of equipment such as measuring instruments can also be considered, thereby achieving a maximum overall transparency. This means that machine set-up times in the product are optimized and downtimes are reduced to a minimum. The standard range of tools for every machine is recorded in the TDM Machine Tool Manager and so, once a job is complete, the program can automatically check which tools are to go for disassembly and be put back into tool crib, and which are to remain on the machine. In the process, they are booked back into tool crib. Consequently, disassembly is fully transparent, which allows tools and items to be quickly located for the next production job.